have you read the secret? i know, it was all oprah could talk about for awhile, and like the rest of america i was totally sucked in. but one of the things i got out of it was this: create a vision board of what you want your life to be and you will manifest it. it was 2008 when i read that, and having nowhere to go but up i crafted one. i remember thinking, these goals i’m putting on here are CRAZYPANTS, but if i’m dreaming BIG, this is it. here i am, 4 years later and i just stumbled across my 2008/2009 vision boards. and guess what: EVERY SINGLE DREAM AND WISH MANIFESTED. of course, i worked for them. but keeping my eye on the prize, making a visual commitment and focusing in on my intentions, it sure as heck didn’t hurt! so in a crazy bout of insomnia tonight i made a new one and it’s now my desktop: chock full of inspiration, reminders, goals and things to look forward to! i love this. someone recently told me that energy follows intention and in the short time since i've heard it, i've found this to be true. i started my blog for this reason and it's so motivating to see other people share their stories and watch them manifest their reality. thank you for sharing! I have one and completely believe in them!! I hung it in my closet, a place that I am in everyday, so there isn't a day that goes by that I don't see it and think about it. It keeps me focused and grounded. So many of the things that are on it have come to life- so much so that I need to do a new one! @tiffany, i want to see your closet! 🙂 i love that. i feel so inspired and excited just seeing my inspiration board- the anticipation of all of this goodness might just be as fantastic as the goodness itself. I've never read The Secret because I thought it too "hokey" but now I'm curious. Things haven't exactly gone as hoped/planned in life in the last few years so maybe a change is in order. As I get older I feel more open to new things and different ideas I may have once dismissed. I love your inspiration board! It's such a lovely, visual way to track goals. Much better than a journal or a New Years resolution list like I do every year! My favorite piece on your board was "stop the glorification of busy". I pinned this a few weeks ago and so fully agree on this. So many people rush around life these days using busy like it's the end all and be all of excuses (and an excuse for a lot of bad behavior). Busy is not the best thing in life! People need to slow down to enjoy life more otherwise it's just a blur of one thing after the other. Thank you for a lovely post! Thank you so much for the inspiration, Sarah! With a big move in store that comes with quitting my current job, I'm definitely going to make one of my own to keep me focused on moving forward. I did read the Secret and there was some usefull things I took away from it. I also made a vision board and it's amazing to see a visual of what your dreams and aspirations are. It's a great way of getting over the fear of sharing those dreams. Mine was on my wall for all to see. Last year it was time to make a new one and like you the theme of it changed from relationships and things to creating a life and going towards my purpose in life. Awesome post! Thanks for sharing your vision board with us. This is so great! I started mine! 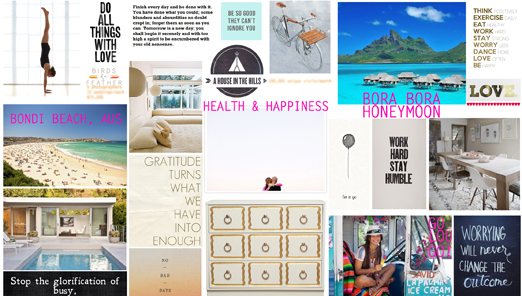 I haven't read The Secret, but I am a big fan of vision boards… Mine are constantly changing. Yay for dreaming of a Bora Bora honeymoon! Same thing happened to me! Everything I visualized 4-5 years ago has happened!! 🙂 Europe, California, etc.! I love The Secret. Sarah- I love this idea! I really want to start an inspiration board this weekend. A 3 day weekend seems like the perfect time! Kind of a funny question, but is your inspiration board something you actually hung on a wall in your office or study? Or is it a digital board? Thanks for the great post! @rachel- mine is my desktop computer background. i look at it most everyday! i love the idea of a physical one, but this was much quicker for me to put together. finding photos of all of these things might've been a challenge. but also would be rad! How did you create this board? I would use Pinterest, but then it wouldn't be on my desktop so I wouldn't see it all the time. Plus, you can't change around the order of pins on Pinterest.